Desde que Google Earth incluye la capa 3D de edificio, cada vez más edificios están apareciendo por toda la tierra. Google Earth que es. This is a great platform for business owners to promote their locations. Google Earth is so effective because it taps into a deep image that we all understand — the planet. 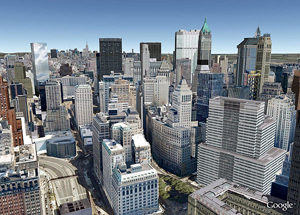 But many modelers find obstacles when they first begin to create models for Google Earth. This post is for such starters. I’m basically laying down some ideas on what things must be considered and things to avoid when creating a 3D model. First and foremost is to “Keep it simple”. This is very important. This was the most difficult thing for me to personally accept when I started Geo modeling, but the simple fact is that there’s a big difference between what makes for an appropriate architectural model versus what makes an acceptable model for Google Earth (GE). Primarily, GE buildings need to have as few faces (few polygons) as possible and they need to be photo textured. Use photos that were taken during the day and with the least amount of obstacles or “extras” like people, cars, trees, etc.. With this, we are assuming that the building you want to model actually exist. De lo contrario, it will be rejected by the Google Earth team. Use the help files and videos provided by Google. Seriously, they help. Don’t spend too much time positioning the building in SketchUp. It is far more important that the building later appears on the correct spot in Google Earth, and in my experience this means that you have to slightly shift and rotate the building anyway before uploading since the two almost never match perfectly. There is always the recurring problem that many models intended to be accepted to the 3D Layer of GE are rejected for incomplete texturing. Even the smallest face that you didn’t notice to be still bearing the “default material” can be the culprit. So we need a way to “discover” these faces and have a trick to make sure there are no faces un-textured. When you are done with modeling and texturing your model, move into the building and check if there are any unneeded (and usually un-textured) faces inside that you didn’t notice from the outside. This happens quite often actually. You could also just make a group of your model and then paint the group “from outside of its context” with some bright, striking color (Like bright green). This will reveal any obtrusively apparent, non-textured faces that may still need texturing. Si es así, edit the group and texture these faces with an appropriate texture or color. Texture size: A similar topic of efficiency are texture sizes. In the forums people often present simple models that are 2, 5 or even 10 MB of size. Looking at the original SketchUp file reveals that they applied images to the model mainly as they came out of the camera. Beware! If your model is intended for Google Earth bare in mind that no one will look at your model from a distance of centimeters. Usually people will hoover around your building at a distance of 10 a 50 meters. That’s where your model must look sufficiently detailed. Recently, my brother sent me from Venezuela 24 pictures of the building he lives in. Each picture was at least 2.5 MB each. Imagine what it would be if each and every picture made it to the final model? Let alone being appropriate for Google Earth. Por último, take the time to investigate about the building you are modeling. During the upload process, you will be ask to enter some information about the building you just made and intend to share with the world. It would be great if you could write as much as you know about the building. Things like, local business in the area, address, year built, etc.. The more you write, the more interesting it will look, but make sure the information you provide is accurate and will not change in years to come. Let the modeling begin and have fun! Be sure to check out the video! You can also check out some of my models by visiting my 3D Warehouse here. I am just curious what will be next. Usually people think only about themselves but this could really change because we have such people who partake their knowledge and information – thank you!